Conditioning flowers with vodka & honey seems to work! Back in late June, I did a little test on how to condition flowers. ‘Conditioning’ in this context, means to prepare flowers for a vase, in order to maximise their ‘vase life’ before they fade. I was testing the theory that adding a little alcohol and sugar to the water in the vase, would make the blooms last longer. Many people use conditioning mixtures for bouquets, and the usual formula is something to kill bacteria, such as bleach or vodka, and something to feed the flowers, like sugar or honey. 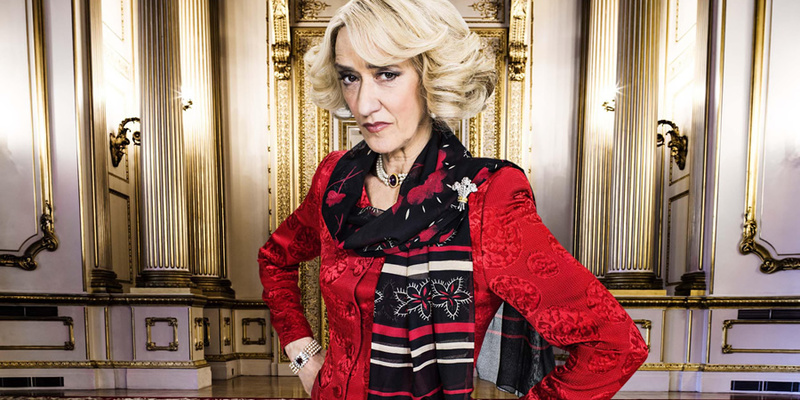 Our probable next queen (HRH Camilla, pictured below) suggests using lemonade, which contains citric acid and sugar. 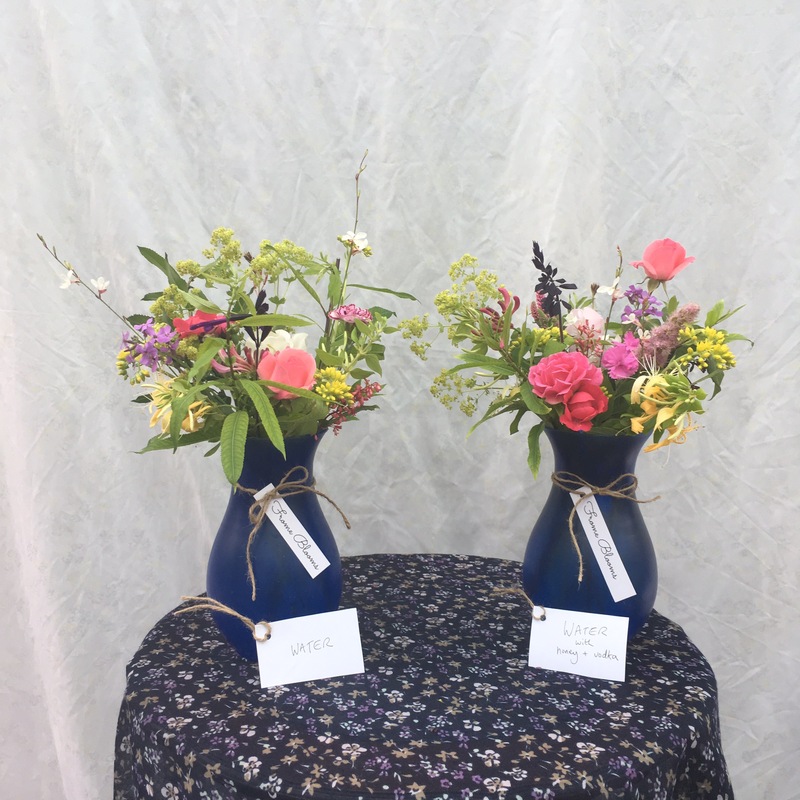 The Duchess… visited plenty of the displays, even imparting her own tip for cut flowers – a splash of lemonade in the vase keeps them fresher for longer. I fancied that a cocktail of vodka and honey might do the trick, so I set up a test with two near identical bouquets from the garden, picked on Monday 26 June, and arranged into these bouquets on June 27th. I was busy, and lazy, and so apart from topping them up with water a couple of times, I left both bouquets alone for a couple of weeks. This is bad form, as you can make bouquets last a great deal longer by refreshing their water each day, and trimming the stems every few days… But I have a garden full of fresh flowers and I don’t prioritise bouquet care. I suspect many of my customers also don’t prioritise bouquet care, although my mum can make blooms last for weeks by taking good care of them! After 8 days, the bouquet in water had faded quite a bit, the rose was starting to drop petals, and the hollyhock flowers had withered and gone brown. The pinks, sedum and willow still looked ok, and most of the lady’s mantle was also in reasonable shape for a bouquet out for over a week in very hot weather. The second bouquet, which had been conditioned in vodka and honey was in better shape. The rose was droopy, but less so than the one in just water. The purple salvia still looked fresh, and the hollyhock blooms were still white and yellow, unlike those in the other vase. Obviously, this test is just an illustration, and more research would be needed to draw a robust conclusion. But it’s enough to convince me that it’s worth putting a splash of spirits and a teaspoon of sugar into the vase with my bouquets, as it does appear that it helps them last longer. Let me know if you find that it works for you too! Have you tried Gin & Tonic? May not keep the blooms blooming, but … And AB testing – ooo – stop it, you’re reminding me of office life!